Egretia has combined existing H5 technology and the production tool to create a complete blockchain game development tool. By using the set of Egretia tools, developers can rapidly create blockchain games without having to fully understand the complex technology implemented on the bottom layer. Also, the development tool could connect the virtual asset in blockchain games. Egretia, together with the world’s leading H5 technology provider, Egret Technology, aims to bring 200,000 developers and one billion mobile terminals into the blockchain world. In this “Bitan Interview”, we invited the founder of Egretia, Mr. Huang Jun, to talk about what revolutions Egretia will bring. 1. Huang, I see you have many years of Internet product and gaming project R&D management experience. How did you come into contact with the Blockchain industry? Huang Jun: I came across the blockchain industry around 2012. I have some old friends who work with software and hardware technology, and they invested in Bitcoin in its early stages, so I have been familiar with Bitcoin and blockchain since 2012. However, at that time, I had not formed a complete opinion about it. 2. Why did you start the Egretia project? Huang Jun: I was working at Adobe in 2014 and because I was so optimistic about the development of HTML5 technology, I joined Egret technology. Four years ago, our opinion regarding the development of H5 games was that H5 gaming certainly could have better performance on the mobile platform. Earlier this year, Tencent, Facebook, and other internet giants all had a H5 game line. So our initial judgment about HTML5 was correct. The first reason is based on our judgment regarding the trend of technology. The entire Blockchain market is still at an early stage. Starting Egretia now, a blockchain gaming technology service provider, seems relatively early, but we feel that this is a promising direction to take. Any and every technology will go through a long process from its birth to its rise in popularity. I do believe Blockchain technology is the trend of the future. If we just put enough energy and time into it, then we will certainly see blockchain technology grow in popularity. The second reason is that we need to see how a new technique can realize value. When the game “Catching Crazy Cats” was coming up as the front-runner of the first batch HTML5 games, we saw that the basic concept of the game was very simple. Then later, the type of game and rule became more and more diversified, even gradually developing into more complex, multiplayer games. Throughout the whole development process, content grew from less content to more, shifting from “the nature” to”the quantity”. So with in the same train of thought, along with the development of blockchain technologies also came the improvement of the ecological environment.. There will be a large number of requirements for DApps on the market. Today, there are a lot of projects to on the chain,and the biggest need is to have a real product as soon as possible. The third reason is that we should have plenty of developers to help build the ecological environment. Since the creation of Egret, we have always had one goal, and that is to create a complete workflow environment for development as well as provide easy-to-use tools as a one-stop solution for developers. After just four years of development, Egret now has over 200,000 developers across the world and Egret engine tools have already covered more than 1 billion mobile terminal equipment units. What is Egretia’s goal? Our slogan is to bring 200,000 Developers and one billion mobile terminals into the Blockchain world. Egret posseses mature and refined tools, comprising of 14 tools total. Through combining our existing tools and Blockchain technologies, we have sealed the complex APIs and chains in the background, greatly enhancing development efficiency. Developers can use their existing knowledge and skills, and do not need to spend too much energy and time in studying this complex new technology. Developers can focus more on developing fun DApps and let Egretia do the dirty work of complex tasks. What’s the value of doing these things? We observed that no matter what kind of new technology, it will require content and application to drive its growth. Why is VR/AR less popular now? The reason is that its technology is not friendly enough to developers, resulting in scarcity of content and an inability to have a complete and healthy ecological environment. Blockchain industry and technology will become more valuable as more apps come up. When tokens truly have users, it will then be able to liquidate in the market. Otherwise, the Token is only in the exchange, and there is no way it could cover the majority of the target users. 3. In the white papers, it mentioned the various roles Egretia Token has played within the system. A very important function is that it replaced the current game industry payment system. What problems does this resolve for the ecological participant? Huang Jun: We will use Tokens within the Egretia system to build a complete economic system. For developers, if they have a good project, we can support and incubate it within our official Token. If they produce good content, eventually they can get Token from users. For the users, if he/she finds an interesting game, he/she can use the Token to support it, which is also a sort of recognition for the Developers. From the complete tool perspective, we will open-source our API so that everyone can help us improve the tools. As long as you provide constructive criticism to us, you will get official Token rewards. Ultimately, once our ecology become more prosperous , Token will be liquidated on the Egretia platform. At present, our primary task is to build the existing tools using blockchain technology, allowing developers to quickly produce more high-quality content that could become the next super-star game. 4.Egretia as a game development tool and service provider will be involved in the economic field of the entire game industry, and can even be considered to penetrate to the interior of the gaming economy. Do game developers and operators have any concerns about this? Huang Jun: I think for game developers and operators, they do not need to have concerns since we only offer value-added services. Why is it that most developers, after developing an Android version, also want to develop an IOS version? It is because they are hoping to reach more users. If their product in certain channels have been validated and well-received, why not put these products through Egretia, a convenient development channel, to the blockchain users? This is value-added service for them. They not only get extra Token but also accumulate more users. Developers will eventuallyfind that using blockchain technology and smart contracts can produce a truly fair game. I feel that developers will welcome this new channel and will enjoy using this new technology to contact more users. 5. If the Token could be widely used in all areas, it would certainly be more convenient for the users. But it might have some effects such as the disappearance of the current funding entrance but players’ asset liquidity would, on the other hand, be greatly enhanced. What are the advantages and disadvantages of the Tokken towards users and the industry? What do you think of these? Huang Jun: I think Token will definitely have an impact on the entire industry, and the use of district blockchain technology will certainly change the traditional channels of communication. Traditional channels of communication, in reality, is a monopoly market, a centralized market. And if we are able to use blockchain technology to truly achieve decentralization, then the whole industry will be driven by the contents user’s really enjoy. This is no doubt a very healthy development trend. Blockchain technology’s impact is very broad and not just limited to the gaming industry. I have seen a lot of companies use the blockchain technology that IBM provides to enable companies to operate more efficiently while reducing waste resources. I believe that in the future we will see more and more great products and more and more practical applications accepted by the companies. They should grow in profit through this process. 6. The design of Egretia, also referred to as various virtual assets stored in a wallet, would involve large amounts of data being stored on the chain. Will this cause problems in efficiency and storage capacity? The first step is, a lot of the games developers make are merely payment connected, and you can buy simple items such as resurrection cards, magic cards, etc. The second step — connect the core assets to the blockchain. By doing this, the total number of assets will not be able to be easily changed and the issue of fairness of the game will be resolved. We are currently testing our internal network and have reached nearly 3000 TPS, a speed fully capable of supporting a large number of transactions within the games. The next step for when we reach a better and faster computing power is to put the game logic into the smart contract. For certain types of games, chess for example, fairness is very important and so we can put its game logic on the blockchain and place it inside the smart contract. I personally prefer step-by-step to achieve a variety of functions. When H5 technology and games were just coming out, we all thought that “Catch Crazy Cat,” this kind of product, couldn’t be called a true “game” since its rules are very simple and the graphics are very basic. Including — and especially — the first blockchain game “Crypto Cats,” we also feel like this cannot be called a real game. However, technical development is an iterative process. Just like for original website games, beginning with car parking games, stealing food games, then developing into interactive games, and then later 3-D page games. All technical and content development will go through a gradual, evolutionary process. Blockchain technology is able to resolve some long-standing problems in the gaming industry, such as “opaque data.” Although current blockchain technology is not a perfect solution, I am very optimistic about its future. There will be more and more Blockchain-based content being developed to improve content on demand and even improve the performance of the blockchain. Why Bitcoin fork? What’s the next generation of Ethereum? What problems does EOS super node solve? It is because we have real needs and these needs drive the technology progress. With more and more applications popping up, users’ demand will increase too. Projects, including Egretia, will gradually iterate and improve. Rome is not built in one night. 7. The White Paper mentions that players can mine the token. What can you tell us about this mechanism? Huang Jun: This is an idea somewhat similar to an incentive mechanism for the community or the player. Our initial thought is to have an algorithm that incentivizes users base on live time. Of course, after our chain goes online, we may provide relevant software solutions or hardware solutions, but for now the plan has not been finalized yet. 8.Egretia’s incentive mechanism is POG. Will it have an incentivation problem? Huang Chun: This is exactly what we need to pay attention to to try and avoid. We will design a good standard and judgment mechanism. If a Token and some points have a certain exchange relationship, then users may use this relationship incentivize more points in exchange for more Tokens. This is what the front-end and back-end must solve. But the entire industry is facing the same problem as well. 9. Why does Egretia want to build their own chain? Similar DPOS-using mechanisms have EOS and BTS, and so, why not just choose one of them? Huang Jun: First of all, our strength is to provide front-end and back-end services and create the workflow. Our tools, SDK, and cloud services will support the mainstream public chain, such as EOS, Ethereum, and so on. Our vision is not only to support our own chains. So why do we want to do it ourselves? Because we need to improve some features, particularly for the game industry. Ethereum is a mature and stable chain, so why not just do it on top of it? Operationally Ethereum is fine, but for games, we have found that it cannot meet certain requirements, so it is better to re-design a chain specifically for the gaming industry. Based on the demand from the gaming industry, we will gradually perfect Egretia’s public chain. I have developed a process which, if there are other chains issued that are very suitable to the gaming industry, we will consider it. Our front-end and back-end technology could quickly access the chain. 10. Egretia plans to give the game server-side access to the network and become a blockchain node. Will this increase the input costs? Huang Chun: This is the service we wanted to offer to aim at reducing costs for small and medium teams. Big development teams can build servers for themselves but many small and medium developers may prefer to access existing back-end services. Our partners, or us ourselves, can provide more convenient service. For example, those who develop a multiplayer game could quickly connect to the nearest server to ensure a better user experience. 11. The reform Egretia brings to the game developer is not just for technology. Since there is no developed method to allow for centralized service access to the blockchain, developers might need to consider transitions in the development process, too. In addition to providing a convenient development tool what else can Egretia provide? Huang Chun: We will maintain long-term communication with our developers, including social and technical forums where members can learn from each other. We will also organize periodic blockchain game conferences everyone can work together to understand the future of blockchain games. In the blockchain industry, just talking about empty concepts cannot bring about real growth. We need to explore together and and push to further the entire industry. We will also support a number of high-quality business developer teams, and thus contribute to the blockchain applications. We are currently planning to organize a blockchain gaming conference in late May, and after that other countries will have similar conferences too. We hope to gather more developers to push the development of the industry. 12. For blockchain gaming, maybe due to the industry’s threshold, users are typically people from the coin world. There are not many traditional game players coming in. Do you have any solutions to this problem? Huang Wei: I think users need a guided process. Players in the coin world may have some intersection with traditional game players, but that’s not absolute. The most important thing is how to design a game for users in the coin world based on their special characteristics. For traditional game players, how to solve their understanding of Token and how to provide them with more convenient Token payment methods. At present, users need to install wallets to play games. After the wallet is installed, where Token comes from, how to get an airdrop, how to go to the exchange, and so on, the users do not understand. In this case, the entire industry does not actually open to the public. And getting through this whole process requires the collaboration of the entire industry. This is also what we want to do in the future. We will work with wallets and exchanges. Users who are not in the coin world can also have a better experience and use Token more smoothly. 13. Recently, Cocos2D and Unity3D both stated that they are willing to enter the blockchain industry. 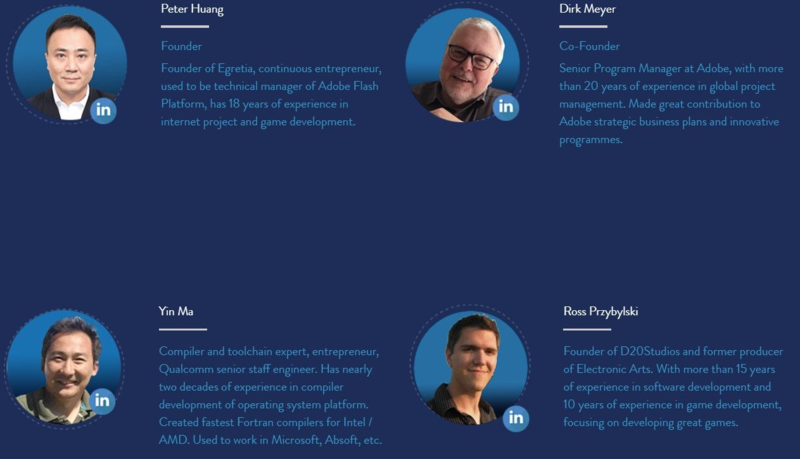 Are they competitors of Egretia? What is your view on their move into the blockchain sphere? Huang Hao: If there is no competition in the industry, then it means that the industry simply will not flourish. I think that competition is a good thing. Cocos2D is an old brand for many years. And for Unity3D, no matter if you’re looking at their product or business model, they’re great at both. Unity is also working with third parties to introduce the Token mechanism. I think these are all positive signals. We are very open about this kind of competition. It requires competition to be able to make yourself better. More and more people want to do this, indicating that this industry is doing well and the is are moving in the right. 14. The roadmap shows that in 2018 Quarter 2 you will release testnet and other tools. When did Egretia start development work? Huang Hao: Developmental work has been going on for more than a year. In addition to our own team, there are some strategic partners of ours working together on development. Internal testing is currently going on but has not been opened to the public yet. At present, the testnet and test tools are planned to be announced at the end of the second quarter, and will be availble for everyone to test. 15.Egretia mentioned that it will support game development teams and individuals. We as a blockchain related media have also been exposed to a number of developers interested in blockchain games. Can you tell us what resources and help Egretia will give to game developers, and what the requirements and restrictions are for developers? Huang Wei: First of all, as for the requirements and restrictions, I don’t think there will be any restrictions. As long as it is a good team, a good idea, or they have a proven product, we can provide support. We will provide support from both technical and financial aspects. On the technical side, we can help them better connect to blockchain technology. With respect to finances, we can help them solve the team’s survival and development issues through equity investment, Token investment, and so on. Token is used for effective services based on DPS (Delegated Proof of Share) consensus mechanism aimed at optimizing the performance of HTML5. Through the level of the blockchain interface, in combination with the tools of the Egret engine, developers can quickly create dapps based on blockchain. Lockup Period: 4 months (20% token released per time, total 5 times, The first phase releasing on the same time when public sale tokens being released).